Meet Benson Schwenson, a self-confessed ego-maniac who uses his fame and fortune to provide opportunities to those less fortunate than himself as part of his quest toward enlightenment. With 6 way-out characters, singing, dancing, and whole lot more, it redefines what can be achieved in live comedy. The motley crew includes an Afrikaans pop star, a flamboyant dancer, a rapping Christian granny, and a homophobic self-defense expert. The end result is nothing short of hilarious. 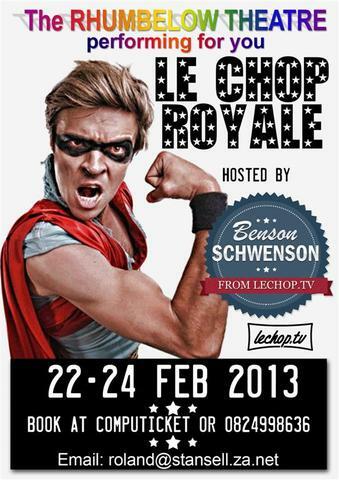 Le Chop Royale is written and performed by Cobus van Heerden (Wizard of Oz, Abbamaniacs, Fallen [SABC 3]) and has directorial assistance from Liam Magner and David Gouldie it is a one man comedy of epic proportions. 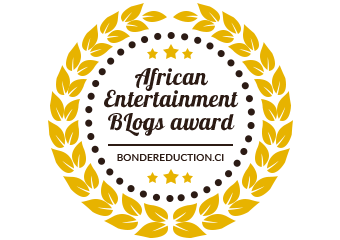 Winner of the Suleiman Selection Award and the Musho Festival 2013 Best Performance Award Le Chop Royale is not to be missed. Check out www.lechop.tv for a sneak peek of what you can look forward to seeing and be sure to book your tickets for this weekend’s performances. Bring food picnic baskets. Braais will be available should you wish to cook some meat. Limited secure parking is available. Booking is essential.